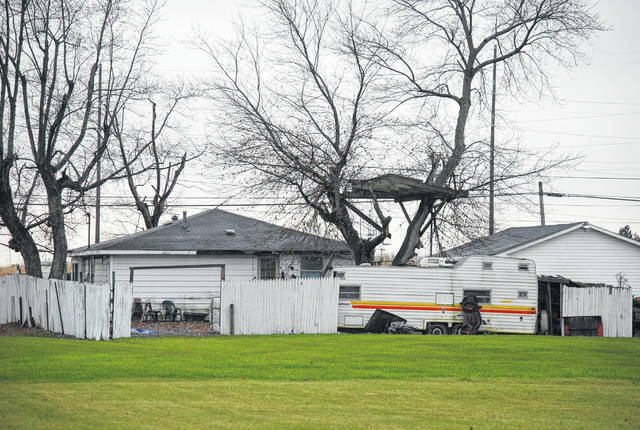 A travel trailer at the rear of a property at 102 W. Hanthorn Road must be moved or otherwise made operable within 45 days and junk scattered around the property must be cleaned up as part of a court-sanctioned agreement between the Perry Township Trustees and resident Floyd Russell. The home of Floyd Russell at 102 W. Hanthorn Road has been the target of enforcement actions by the Perry Township zoning inspector for several years. Neighbors have complained to trustees about unlicensed vehicles and junk that have reportedly littered the property on and off for years. 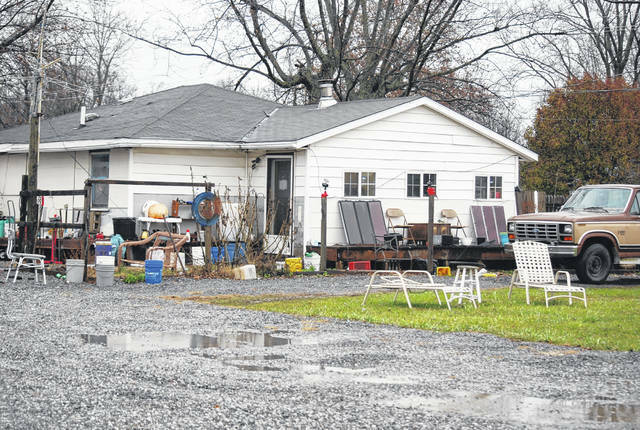 PERRY TOWNSHIP — A Perry Township resident has agreed to rid his property of junk items and inoperable vehicles within the next 45 days and to refrain from running a business from his home. Informal, 11th-hour negotiations between Floyd Russell and township officials took place in the hallway outside Allen County Common Pleas Court on Monday as the two sides agreed on the clean-up schedule. The Perry Township Trustees, through their attorney, filed a motion in Allen County Common Pleas Court on Oct. 4 asking the court to issue a preliminary injunction preventing Russell from using his property at 102 W. Hanthorn Road to house disabled and/or unlicensed vehicles, accumulated junk, discarded objects and debris and ordering him to stop operating a junk collection business at that location. All the listed infractions are in violation with Perry Township Zoning Regulations for a residential area, according to the motion filed by attorney Derek Younkman. In a sworn statement on Oct. 3, Perry Township zoning inspector Tony Hayes said Russell “appears to have stored/parked vehicles without current license plates, plates accumulated and or stored junk, junk vehicles, inoperative/disabled vehicles, discarded objects … and is operating a business at 102 W. Hanthorn Street” in violation of township regulations. Hayes said that on or about Aug. 22 the township’s legal counsel sent by certified mail a letter notifying Russell he was not in compliance with zoning regulations. Russell agreed in open court to the 45-day grace period to clean up his property and also agreed to pay $206 in court costs to resolve the case once township officials re-inspect the property and declare it to be in compliance with township regulations. Following Monday’s hearing, Hayes said he hoped Russell would comply with the agreed order, but noted that township officials “have been going through this for the past three years” with the Hanthorn Road resident.